Combine Crema Agria, Italian Seasonings and pepper flakes; mix well. Place pizza crust on cookie sheet or pizza baking pan. Spread cream mixture evenly over top of crust. Scatter shredded chicken over top of cream mixture; top with tomato slices. Sprinkle onion evenly over chicken, dust with pepper. Sprinkle cheese over top. Bake at 450°F, 10 minutes or until pizza topping is bubbly. Cut and serve immediately. Variations: Add thinly sliced eggplant, drained canned artichoke pieces, sliced mushrooms, sweet bell peppers. 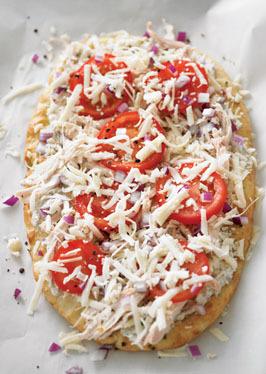 Tip: Deli-cooked chicken left-overs work well as an ingredient for making this pizza.